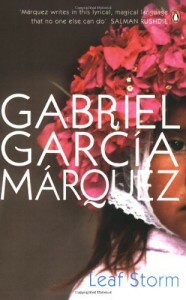 Oh, Gabriel Garcia Marquez, I guess it wasn’t third time lucky for us. Having really liked the previous two novels I read by Marquez (Chronicle of a Death Foretold and The Story of a Shipewrecked Sailor), Leaf Storm was kind of a major letdown.Marquez’s gorgeous writing style was out in force throughout the novel, which means that it is by no means a total failure; his ability to bring places to life is incredible and there is a specific passage about the movement of time that is just beautiful.Yet this prose didn’t detract from the fact that the novel rubbed me the wrong way. For starters, the novel is told from three different viewpoints; that of the Colonel, his daughter Isobel and her son. I normally have no problem with this; and to begin with I quite liked its use in this novel. However, it got increasingly difficult to work out who was talking, and I had to wait until I came across a reference to either grandfather/father/daughter to work out whose perspective I was reading. The central character of the Doctor, and his interactions with the Colonel were also a point of serious contention for me. In the synopsis the Colonel is referred to as ‘the one last honourable man’ left in the entire town. However, the Colonel’s total trenchant self-belief makes pretty much everyone around him unhappy, which strikes me as far from the type of person whose decisions one should replicate. For instance, he feels he can make no aspersions on the character of his daughter’s husband, who disappeared to make his fortune and never returned; seemingly only wanting to get the Colonel’s recommendation. The Doctor is loathed in the community because he refused to treat ten wounded men. This is linked to the arrival of the factories that bought with them their own medical care. Whilst a point could be made here about the destructive power of changes; I felt pretty much no compassion towards the Doctor, who just struck me as cold and cruel. I’m really gutted that I didn’t like Leaf Storm as much as my previous explorations of Marquez; but it certainly hasn’t put me off Marquez all together.